Omnes Audio PowerSat BB 8.01 is a compact loudspeaker with a full range driver. 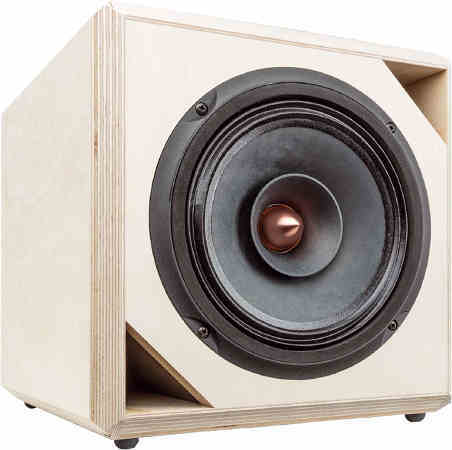 PowerSat BB 8.01 is a bass-reflex cabinet loudspeaker with drivers of Omnes Audio . The loudspeaker has been developed by Thorsten Fischer. The crossover consists of a wave trap circuit in series smoothing the frequency response. The frequency response of this speaker is mostly linear. At low volume, i.e. 85 dB at 1 m, the nonlinear distortions are below 0.2% above 500 Hz and doesn't exceed 0.7% at 95 dB at 1 m between 300 and 15000 Hz. The high-end kit is delivered with copper foil coil for minimizing microphonic effects. - The current flow through the coil creates a magnetic field which sets the reel of wire in motion. This motion induces a voltage in the coil which adds itself to the signal. The stiffer the reel of wire is, the less the signal will be altered. The capacitors for the fullrange driver is of type polypropylen (MKP) Clarity-Cap CSA 630 V.